It is crucial that your oral hygiene is taken care of on a regular basis (brushing two times daily, flossing, and regular visits to the dentist), this will prevent bad breath and dental diseases. But for some, no matter how well we follow the oral hygiene routine, we end up with stained teeth at the end of the day and wanting those pearly whites. The Crest 3D White Whitestrips with Light Whitens 2x better than a professional treatment (vs. an in-office 40% hydrogen peroxide treatment). Using the same enamel-safe whitening ingredient used in dentist offices, the Crest 3D White Whitestrips stays put once applied thanks to their Advanced Seal Technology’s no slip grip. The strips also mold to the shape of your teeth and come off cleanly. The Whitestrips are easy to use: you can whiten while you walk, talk, work, even drink water. Crest 3D White’s new, unique blue light system uses the same type of light technology dentists use. This lightweight, disposable, handheld blue light device weakens stains so that the whitening ingredient can work more effectively. Resulting a dramatically better whitening compared to strips alone that lasts up to 36 months. How To Use: Apply Whitestrips to upper and lower teeth once daily for 60 minutes total. Then apply light to upper and lower teeth until it turns off automatically. Full results in 10 days. I have used Crest 3D White Whitestrips from time-to-time (i.e., once a year) and it's safe to say, my teeth have been brighter since using them. With Crest coming out with a Whitestrip kit with Light, I'll admit I didn't quite understand why the device is needed when the strips alone works just as good on its own. The Crest Whitestrips works the same as any Crest Whitestrip, just apply the strips to the upper and lower teeth and leave it on for 1 hour. After the 1 hour is up, I took the Light device and placed it against the top strip until the light automatically turns off (about 5 minutes) and repeat for the bottom strip. When that's all done, I remove and tossed the strips in the garbage and rinse the device under water. That's it! Nothing to it! Did I notice a difference after completing the kit in 10 days? Yes, my teeth are whiter! That being said, they work just the same as any Crest Whitestrips - we will have to see overtime if my teeth maintain white. If you don't want to shell out $100 for a Crest teeth whitening kit, then just stick to any Crest Whitestrips. 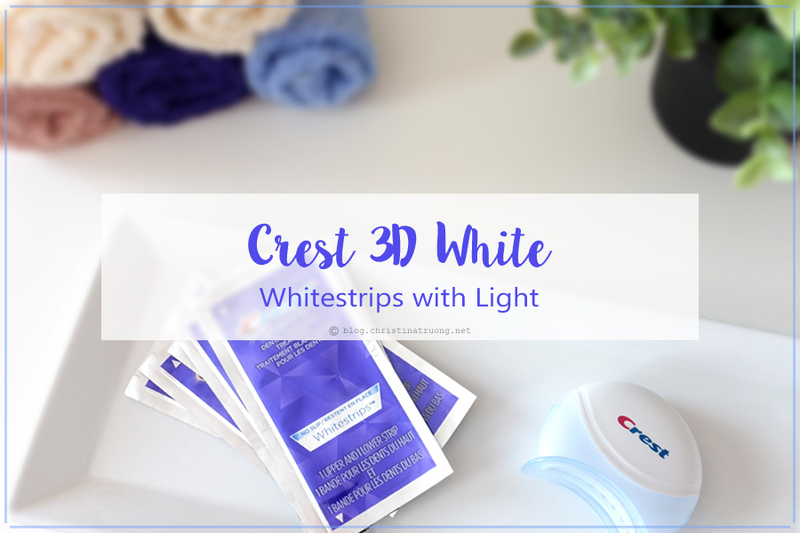 What are your thoughts on Crest 3D White Whitestrips with Light Teeth Whitening Kit? Have you tried Crest Whitestrips before? Are you a fan of at-home teeth whitening? Disclaimer: Products complimentary for review purposes. Views expressed are honest and of my own.